The battle for the overall honours is over but there is still a very prestigious stage up for grabs. While the GC riders will celebrate their exploits over the last three weeks, the sprinters prepare themselves for one final hit-out in Trieste that will offer the likes of Giacomo Nizzolo, Luka Mezgec and Elia Viviani a last chance to break Nacer Bouhanni's sprinting dominance. Unlike the Tour and the Vuelta which always finish in Paris and Madrid respectively (even though the Vuelta will deviate from that pattern in 2014), the final destination of the Giro varies a bit. It is very often Milan which hosts the final stage of the Italian grand tour but in 2009 the race finished in Rome and in 2010 Ivan Basso was declared winner in Verona. After finishes in Milan in both 2011 and 2012, the 2013 edition finished in Brescia and for the first time since 2007 when Maximiliano Richeze sprinted to a win in Milan, the final stage was not a time trial as Mark Cavendish ended his impressive Giro campaign by taking another sprint win. This year the Grande Arrivo has been moved to Trieste to celebrate the 60th anniversary of the city’s return into Italy’s hands and again the organizers have decided to allow the sprinters a final chance to shine - maybe as an incentive to make them stay in the race in the brutal final week. Unlike the Tour and Vuelta which usually end with very short stages, the riders will travel a rather long distance as they will head over 172km from Gemona del Friuli to Trieste. The stage starts at the very symbol of the devastating 1976 earthquake. It is flat, straight and constantly descending towards the lowlands and the regional capital, with just an uncomplicated climb at Passo di Monte Croce (category 4, 1.3km, 4.0%, max. 8%) between Nimis and Faedis. The route goes across Cividale del Friuli Redipuglia and Miramare, then it reaches Trieste, where the stage will finish after covering 8 laps over the 7.2-km long, fast city circuit, marked by a short climb in its central part. The feed zone is located in Monfalcone. The 7.150-m long circuit stretches along wide, well-paved, flat avenues that lead to the short climb located in Via San Marco. The road climbs at a steady 5-6% gradient over a few hundred meters. The first part of the descent features a series of short bends on narrowed roadway, and then rolls on long, straight roads across the city center. In the final 2km, there are just three slight bends, with the final two coming 600m from the line. Heading along the seafront, the road bends slightly to the right, leading the riders onto the home stretch which is 250m long on 6.5m wide, asphalted roadway. Last year the final stage got a lot of criticism from the riders that deemed the final circuit too dangerous and the stage too long. While the organizers haven't reduced the distance by much, they have certainly made the circuit a lot easier and there are no major technical difficulties this time around. The main obstacle is the small climb that may be used as a launch pad for an attack but it should do nothing to prevent that the Giro d'Italia ends like most other grand tours: with a big bunch sprint suiting the fastest sprinters. Trieste last hosted a stage in 2009 when Alessandro Petacchi beat Mark Cavendish in a bunch sprint but none of those riders will be present when the sprinters line up for the expected battle tomorrow. This year's Giro d'Italia has been held in far warmer conditions than last year's freezing cold but instead the rain has played a massive role. Unfortunately, there is a risk that the riders will again need their rain coats to stay dry in the final stage too. It will be a beautiful sunny morning in Trieste but as the days go on, the sky will become more cloudy. There is a slight risk that a shower will make the final circuit wet but the riders may also be lucky and complete the stage in dry conditions. The temperature will reach a maximum of 20 degrees. It will be a bit more windy than it has been in most of the race as there will be a moderate wind from a northwesterly direction. This means that the riders will have a tailwind during the long run from the start to Trieste. On the finishing circuit, there will be a headwind on the climb before the riders turn into a crosswind. Wiht 600m to go, they turn into a tailwind for the sprint. Unless it is a time trial, final stages of grand tours usually have an almost predetermined pattern. The battle for the general classification is over and there is a consensus that no one tries to change the standings as they stand at the end of the penultimate stage. That doesn't mean that there won't be any racing though as the final stage is always a very prestigious one and in some cases, the points jersey may still be up for grabs as well. While the Champs Elysees stage in the Tour de France always follows a very traditional formula, the varying nature of the final stage of the Giro d'Italia means that here is a bit more room for innovation. In the Tour, it is an accepted rule that the first part of the stage is used to celebrate three weeks of exciting racing, congratulate the winners, take some photos and take a glass of champagne before the team of the race leader takes control of the situation and leads the peloton onto the finishing circuit where the real racing commences. Most likely, we will see a similar pattern in tomorrow's stage but we may see some racing before the riders reach Trieste. Last year the riders were unhappy about the length of the stage which seemed excessive for a largely processional race and wanted to show their dissatisfaction in the early part of the race. A few riders tried to attack pretty early and that caused some disagreement in the peloton. This year the riders may again be displeased with the distance and we could see some riders venting their frustration against the organizers. There is a chance that the racing will start even before the riders reach Trieste but the most likely scenario is the traditional one that sees the first part of the race take place under a ceasefire. When the riders reach the finishing circuit, we will get a real spectacle and some very fast racing. This year's circuit is not very technical but instead the organizers have included a small climb close to the finish. That is pretty unusual and could make the race a bit harder to control. The sprint teams made a big mistake in stage 13 when they failed to bring back the early escape. It capped off a trend that has seen them have quite a bit of difficulty bringing back the early breaks and things usually don't get any easier towards the end of a grand tour. With a small climb on the circuit, things will become even more difficult and there is a bigger chance than usual that an escapee will be able to deny the sprinters. In stage 13, the sprint teams deliberately made a gamble, leaving most of the early work to FDJ in an attempt to tire out Nacer Bouhanni's teammates. They clearly lost and we doubt that they will take a similar risk in the final stage. The brunt of the work will of course be left to FDJ but Trek and Giant-Shimano can also be expected to lend a hand. Over the last few sprint stages, Cannondale have been riding rather conservatively and they may be the only sprint team to make a bit of a gamble. However, there should be enough of an interest in a bunch sprint to bring things back together. The final climb is too easy to do any real difference and at most it may be used to tire out the sprinters. The headwind won't make it any easier for the attackers and even though we will definitely see a few riders use it as a launch pad for a last-ditch effort, it's hard to imagine that the stage won't be decided in a bunch sprint. It will be interesting to see how Team Sky handle the stage. In stage 10, there was a small climb close to the finish and on that day the team rode hard up the ascent in a quest to put the sprinters in difficulty, knowing that Ben Swift is the superior climber among the fast finishers. It would be no surprise to see them try a similar tactic tomorrow and one could expect Dario Cataldo to hit the front the final time up the climb. Bouhanni, Nizzolo, Mezgec and Viviani, however, are all climbing really well at the moment and it won't do much to hurt their chacens. Many of the sprint finishes have been rather technical which have made lead-out trains and acceleration extremely important. That has suited Bouhanni's great bike-handling skills perfectly but tomorrow's sprint is a bit different. The finale is pretty uncomplicated and the finishing straight is pretty long. As it will also be a tailwind sprint, this is one for the power sprinters with the highest top speed. Nonetheless, Nacer Bouhanni is still the favourite. He may have benefited from his bike-handling skills to win three stages but he has also proved that he is the fastest rider in the race. Tomorrow it is very likely the one with the fastest legs will come out triumphant and this turns him into the obvious favourite. Bouhanni's FDJ team isn't the one to take control in the finale. Instead, Sebastien Chavanel drops his sprinter off on the wheel of the strongest train and then Bouhanni takes care of the rest himself. No one is able to push him away from the wheel he has set his sights on and he rarely starts his sprint from a poor position. The combination of positioning skills and speed makes him very hard to beat in Trieste. In an extreme case of consistency, Giacomo Nizzolo has finished second behind Bouhanni in the first three sprint stages. 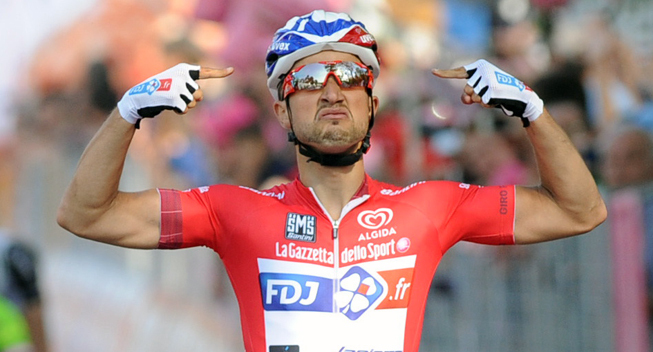 In fact, the Italian has come pretty close and it seems that he doesn't lack an awful lot of speed to match Bouhanni. Like his great rival, he usually benefits from technical finishes and he prefers the finishing straight to be slightly uphill. Tomorrow's power sprint may not suit him perfectly but at the moment he and Bouhanni seem to be in a class of their own when it comes to top speed. Like the FDJ sprinter, he won't have a dominant team in the finale but Boy Van Poppel and Danilo Hondo usually drop him off in a good position. If he can get the jump on Bouhanni in this tailwind sprint, he seems to be fast enough to finish it off. Elia Viviani has been one of the big disappointments in the Giro. Going into the race, he seemed to be sprinting better than ever after having beaten Mark Cavendish twice in the Tour of Turkey but for some reason he has not had the same kind of speed in his home race. As opposed to this, his Cannondale team have proved that they have the strongest lead-out train in the race and when they have not been left fatigued by their chase work, they have dominated the sprints (with the stage to Dublin being the notable exception). Oscar Gatto and Daniele Ratto have done an outstanding job to position Viviani but the Italian has lacked the speed to finish it off. Tomorrow's power sprint may suit him a bit better though and there is a big chance that he will be able to launch his sprint from the first position. In a tailwind, that's a clear disadvantage and so Viviani definitely has a chance to make up for his disappointments on the final day. The only train that can potentially compete with Cannondale is the Giant-Shimano team. The Dutch team failed completely when Marcel Kittel was still in the race but the German was so amazing that he could win the stages despite the failures of his team. Since then they have done much better and the combination of Albert Timmer, Bert De Backer and Tom Veelers is a pretty powerful one. Their sprinter Luka Mezgec is not as fast as the likes of Bouhanni and Nizzolo and he needs everything to go right to win. If his team manages to beat Cannondale in the battle for countrol though, he has an outside chance. Roberto Ferrari has had a difficult first time with Lampre-Merida but in this race he has been getting closer to his former level. The Italian has been one of the most consistent sprinters in the race and he also seems to be climbing better than ever before. On paper, a final circuit race should suit him well and even though he would have preferred a more technical finale, he definitely has the speed to contend for the win in this kind of fast sprint. He doesn't have any kind of support from his teams in the finales but that's no big disadvantage as he always positions himself excellently. If he gets onto the wheel of the strongest train in the finale, he has the speed to win. Ben Swift has been sprinting much better than usual in this race and his performances in the mountains prove that he is still pretty strong at the end of three weeks of hard racing. However, he is no pure sprinter and this power sprint may be a bit too fast to suit him perfectly. His team will try to make it hard on the climb though and with Chris Sutton and Bernhard Eisel at his side, he has one of the best support teams. He is unlikely to win the stage but if his team manages to position him well, he could make it onto the podium. Finally, we will select our jokers. Going into the race, Borut Bozic was working hard to keep his captains Michele Scarponi and Fabio Aru protected but since Scarponi fell out of GC contention, he has been given the freedom to try his hand in the sprints. He crashed in the finale of stage 10 but did well in stage 13. He will be completely on his own in the final kilometres and usually doesn't position himself too well. On the other hand, he is pretty fast and he has a chance of sprinting to a podium spot if things go his way. Daniel Oss finds himself in a similar position as he has been working hard for Cadel Evans in the flat stages. Tomorrow he and Danilo Wyss will be given the chance to sprint and we expect them to put their money on the Italian. This kind of power sprint suits him perfectly and even though he is no pure sprinter, he has the positioning skills to come away with a decent result.